What Else can I Expect from an Online Master's in Supply Chain Management Program? Supply chain management (SCM) is the oversight of materials, information and finances as they move from supplier to consumer. SCM professionals essentially manage the entire lifecycle of a product: how it's acquired, distributed, allocated and delivered. Many major industries, retail, tech, manufacturing, and even the federal government, have a need for qualified supply management experts, making it one of the most in-demand jobs in the marketplace today. Opportunities range from day-to-day, on-site management of people and product flows to office-type positions in charge of supply management, demand forecasting and inventory control. Professionals who thrive in an ever-changing environment and are looking for a rewarding career shift will feel at home in this position. An online master's in supply management will give prospects a major boost in the marketplace and allow them to command a high starting salary (and negotiate a big signing bonus). Employment of logisticians in government and contracting firms is expected to jump 22% by 2022, according to the BLS. IS A MASTER'S DEGREE IN SUPPLY CHAIN MANAGEMENT WORTH IT? Generally, a bachelor's degree is required for most supply chain management positions. However, a master's degree combined with experience in the field can give candidates a competitive edge. Read more here..
WHAT IS A SUPPLY CHAIN DEGREE? A supply chain management degree trains students to oversee materials, information, and finances as they move from supplier to consumer. Read more here..
With a supply chain management degree, you can oversee the entire lifecycle of a product, from the initial allocation of materials to final product delivery to clients. Read more here..
Supply chain management is a competitive field, which gives educated professionals an advantage. Along with certification, individuals without a degree may need significant experience in the field to succeed. Read more here..
WHAT IS A SUPPLY CHAIN MANAGEMENT DEGREE GRADUATE SALARY? Salaries for supply chain managers depend on years of experience and the field in which they work (e.g., wholesale, retail, or manufacturing). According to the Bureau of Labor Statistics, the median salary for purchasing managers, buyers, and purchasing agents was $64,850 in 2016. Read more here..
Based in Seattle, Washington, UW educates more than 54,000 students each year as a public research university. Together with its campuses in Bothell and Tacoma, the university offers more than 610 degree options across 312 programs. Moreover, UW Continuum College provides professional training, continuing education, and lifelong learning to over 50,000 students annually, providing them with flexible learning options in the evenings, on weekends, and online. The master of supply chain transportation and logistics presents an engineer-focused program comprising nine courses, for 43 credits. Students can complete all courses in UW's master's degree in logistics and supply chain online, except for the first course in logistics and analysis, which begins with a mandatory one-week residency in Seattle. During their residency, students attend lectures and discussions, and visit transportation hubs and supply chain facilities in the area. Coursework in this master's in supply chain management online program covers advanced concepts in transportation and logistics, and their overall impact on supply chain management. Students explore quantitative principles and data-driven analysis. UW outlines the course sequence, in which students take one course per quarter. At this pace, students should graduate in two years. Course topics include facility design, IT systems and supply chain integration, freight transport, and finance and performance management. All students complete a practicum project toward the end of the program. A new cohort of approximately 30 students begins every fall. Applicants must hold a bachelor's degree from a regionally accredited institution, and a minimum 3.0 GPA for their last 60 semester credits (or 90 quarter credits). They also must demonstrate 3-5 years of relevant experience working in supply chains, transportation, or logistics. UW holds accreditation from the Northwest Commission on Colleges and Universities. Established in 1887 as a land-grant college, North Carolina State University at Raleigh now serves an enrollment of more than 34,000 undergraduate and graduate students across 11 colleges and in more than 250 programs of study. Students can finish the 40-credit online MBA in as few as 21 months. The curriculum mixes coursework, virtual simulations, and team-based projects, which explore the technology, business processes, and practical applications used across industries today. Students in this program can choose from six concentration options, including those in financial management, innovation management, and supply chain management. Students enrolled in the master's degree in logistics and supply chain management online track develop an in-depth knowledge of the end-to-end supply chain. They focus particularly on the information and supply flow required throughout the process. Students learn to work with multidisciplinary teams, and apply multicultural and global perspectives. NC State's curriculum features support from the Supply Chain Resource Cooperative. Learners pursuing this online supply chain management master's degree may follow an accelerated track, which allows students to finish in less than two years. Students enrolled in the flexible professional track must complete all requirements within six years. All professional online MBA students must complete two three-day residencies, which help students enhance their networks and develop leadership. Core courses, which comprise 19 credits, split into three blocks: finance and markets, analyzing the value chain, and managing the organization. NC State holds accreditation from the Southern Association of Colleges and Schools Commission on Colleges. Located in Los Angeles, California, USC serves 47,500 students, including more than 8,000 graduate and executive education students. The university also offers more than 100 global online graduate programs. USC's master of science in global supply chain management comprises 27 units, and aims to expand the skills and knowledge of professionals already who already work in supply chain management (SCM), logistics, demand planning, operations planning, and procurement. Students benefit from comprehensive academics and practical applications in this part-time master's degree in logistics and supply chain. The program requires eight courses (21 units), plus 2-4 electives (six units). USC's online supply chain master's program follows a lock-step cohort model, which students complete in 16 months. Learners study topics like strategic procurement and outsourcing, communications, and the role of technology in global SCM. The program includes two international travel experiences, in which students visit global distribution hubs. Some courses may require in-person exams, which students can fulfill at a nearby site. Admissions officers consider applicants' previous academic record, work experience, letters of recommendation, and essay responses. Applicants must demonstrate at least three years of full-time relevant work experience. USC does not require any GMAT or GRE test scores, or TOEFL, IELTS, or PTE scores. To verify English proficiency, USC may request an interview from applicants. Founded in 1920, 40 years after USC first opened its doors to an inaugural class of 53 students, the Marshall School of Business now promotes an integrated curriculum of academic instruction and hands-on experience. USC holds regional accreditation from the Western Association of Schools and Colleges. Lehigh University, a private research university in Bethlehem, Pennsylvania, enrolls more than 7,000 students. The school boasts a 9:1 student-to-faculty ratio and a 96% retention rate. Regionally accredited by the Middle States Association of Colleges and Schools, Lehigh offers over 100 undergraduate degrees and majors, plus 87 research-based Ph.D. programs and professional master's degree and certificate programs. The master of business with a concentration in supply chain management offers working professionals a 36-credit, flexible, part-time program. Students advance through the degree at their own pace. The hybrid MBA program gives students the choice to attend every class in person or online. Accredited by the Association to Advance Collegiate Schools of Business International, the master's program prepares students to become business-savvy, globally aware, and economically and environmentally conscious. The supply chain management track requires students to use three elective courses for nine credits. The concentration focuses on demand and supply chain planning, strategic supply management, and transportation and logistics management. From these courses, students gain an understanding of how businesses work together, build relationships, and integrate demand and supply planning across a supply chain. They also learn about the role of supply chains in a business's overall effectiveness, and the flow of information, products, and cash through an integrated supply chain. Lehigh uses rolling admissions for its MBA flex program, offering start dates in the autumn, spring, or summer. To apply, prospective students must submit official transcripts, GRE or GMAT test scores (from the last five years), letters of recommendation, and a resume reflecting two years of post-baccalaureate, full-time work experience. Internships and co-ops do not count toward the work experience criterion. A public research institution founded in 1856, UMD serves over 41,000 students from all 50 states and 118 countries. The school offers 92 undergraduate majors, 107 master's programs, and 83 doctoral programs. The online MBA at UMD comprises 54 credits, and offers five tracks. The supply chain management track prepares graduates to manage local and global operations. Students learn about identifying and mitigating risk, how to improve an SCM operation's efficiencies, and how to apply the latest in supply-chain technology. Students enrolled in UMD's master's degree in logistics and supply chain management online program typically hold eight years of prior work experience. Applicants should demonstrate at least two years of relevant full-time experience on their resumes. The program takes a seven-phase approach to the MBA core curriculum. Core courses include transformational information technology, ethical leadership, the global economic environment, and data models and decisions. All master's degree logistics online students must attend two three-day residencies -- one at the beginning of the program, and one at the end. The online tuition includes the cost for these residencies, and UMD charges the same tuition rates for Maryland residents and nonresidents. Applicants must submit their academic history, GRE or GMAT test scores, an essay, letters of recommendation, and a resume. UMD does not impose minimum test scores, but applicants should demonstrate an ability to handle graduate-level coursework. UMD holds accreditation from the Middle States Commission on Higher Education. BU serves a student body of more than 34,000, with 49% pursuing their undergraduate credentials and approximately 44% in graduate or professional studies. BU's 17 departments offer more than 300 programs of study across three campuses. The private research university started offering online learning in 2002. The 40-credit MS in supply chain management offers online learners a choice of three concentrations: global business, logistics management, and quantitative approaches. The program examines the design, optimization, and operation involved in a modern supply chain. Students study fundamental topics, including lean production, supply chain coordination, risk mitigation, and strategic logistics management. Upon program completion, graduates should possess the skills and knowledge to improve business process flows and make decisions to ensure prompt delivery of goods and services. Students in this master's degree in logistics and supply chain management online typically complete all requirements in 18-24 months. In the global business track, students study the challenges and issues pertaining to managing a global business structure, and learn to navigate geographically and culturally dispersed entities. Students in the logistics track gain a solid foundation in both the qualitative and quantitative methods used to manage global supply chains. In the quantitative approaches track, students build the quantitative skills to analyze and manage complex supply chains. Accredited by the Association to Advance Collegiate Schools of Business International, this online master's in logistics and supply chain management requires applicants to submit evidence of an accredited bachelor's degree, a personal statement, and three letters of recommendation. BU holds institutional accreditation from the New England Commission of Higher Education. Founded in 1949, USD now offers 42 bachelor's degrees, 55 minors, 30 master's degrees, and three doctorates. Situated on a 180-acre campus in San Diego, California, the private, independent, Catholic university serves more than 7,800 undergraduate, graduate, and law students, plus 800 faculty members. Through the 36-unit master of science in supply chain management (MSSCM), supply chain management professionals gain expertise to help their firms progress and thrive. The program begins with a focus on supply management, logistics, and operations. The degree continually expands on these principles while also integrating contemporary best practices in negotiations, law and ethics, leadership, and change management. Students also tackle topics like sustainability in supply chain and value network management. USD's online master in logistics and supply chain management comprises 13 courses. The final course, worth 1-3 units, operates as a sponsor-based project in which students address topics like team formation, developing charters, and quantifying financial impacts. Students complete a similar project mid-program, in which they focus on becoming effective project managers. The MSSCM at USD requires approximately 25 months for completion. Admitted students progress through the courses as part of a cohort. Each semester begins with a mandatory residency on campus in San Diego for 3-4 days where students interact with their instructors and peers. The remainder of the semester takes place online, accommodating the schedules of working professionals and their organizations. USD holds accreditation from the Western Association of Schools and Colleges' Senior College and University Commission. Rutgers University, a public research university in New Brunswick, New Jersey, serves over 70,500 students, representing the largest higher education institution in the state. Approximately 17.5% of all Rutgers students come from out-of-state, including learners from 125 countries. The school offers more than 150 undergraduate majors and 400 graduate programs. Students can complete the MS in supply chain management in one year. The master's degree in logistics and supply chain management online requires no on-campus residency. Rutgers Business School admits new students three times each year: fall, spring, and summer. Serving supply chain management professionals, this master's in supply chain management online program teaches the latest tools, techniques, and strategies used in supply chains today. The solutions-oriented MSSCM curriculum adopts a holistic, end-to-end view of supply chain management (SCM). Classes explore SCM strategy and planning, global sourcing and supply management, production and operations management, logistics and customer service, and cross-functional enablers, including supply chain law and governance, sustainability, and project management. Students select 10 of 15 course options to create a program that best suits their interests, needs, and goals. Rutgers reports that 97% of all MSSCM students work full-time. The university charges the same tuition rate for all online students, regardless of their state of residence. Rutgers does not require the GRE or GMAT, but prefers that applicants submit scores for consideration. Rutgers holds accreditation from the Middle States Commission on Higher Education. GGU in San Francisco, California specializes in education for professionals in business, law, taxation, and accounting. Founded in 1901, GGU became one of the first universities in the U.S. to offer web-based learning programs in 1996. GGU's MBA with a concentration in global supply chain management requires 19 courses, for 54 units. These courses teach the management skills and competencies needed to execute supply chain management in a global setting. Students study the fundamentals of decision-making, managerial analysis, and communications in a supply chain context. Functional courses, meanwhile, examine how business units interact and support long-term goals. The online MBA curriculum splits between foundation, core, contextual, functional, and concentration courses. The online supply chain management master's degree track provides students with the theories and practices to succeed in the global management of purchasing, production, logistics, inventory, and international trade. Learners take two core courses and two electives covering strategic, design, tactical, and execution management used in global supply chain management. As part of their electives, students may take on a local internship in operations management. GGU offers the program online, on-campus, or in a blended format combining eLearning and in-person instruction. Graduates should demonstrate holistic perspectives on management, the integration of business objectives within industry dynamics, and the application of integrated business-level planning. The global supply chain management track prepares students to become change agents within their organizations. GGU does not require GMAT or GRE scores from applicants who demonstrate five years of professional work experience and hold a bachelor's degree from a regionally accredited institution. Applicants who do not meet these criteria are evaluated by their test scores and undergraduate GPA. GGU holds accreditation from the Western Association of Schools and Colleges Senior College and University Commission. Based in Providence, Rhode Island, Johnson & Wales University educates over 13,000 students each year. Across four campuses in four states and through online learning, Johnson & Wales offers programs that integrate the arts and sciences with industry-focused education. In the online MBA in operations and supply chain management program, students take 14 courses for 42 credits. The concentration comprises four courses and develops supply chain management professionals' ability to streamline services and improve processes. Topics include quality control, process improvement, procurement, and profit maximization. The program allows students to delve further into business operations, such as logistics and sourcing. The master's degree in logistics and supply chain management online at Johnson & Wales features a career-focused curriculum that reflects modern business practices and lean principles and methodologies. The program culminates with an interdisciplinary capstone on organizational competitive advantage. Students leave the program able to apply diverse perspectives to supply chain management and account for cultural differences, cross-functional environments, and ethical responsibility in their decisions and solutions. Courses in this online supply chain master's program run for eight weeks, and students can complete all requirements in an accelerated 18 months. With six start dates each year, prospective students can apply to the Johnson & Wales online MBA year-round. Along with official transcripts, applicants must submit two letters of recommendation and a statement of purpose expressing their professional experience, career goals, and potential contributions to the program. Johnson & Wales holds regional accreditation from the New England Commission of Higher Education. MSU, a public research university in East Lansing, Michigan, serves 50,350 students. Learners hail from all 83 counties in Michigan and all 50 states, plus 141 other countries. Undergraduate students compose 78% of enrollment, while graduate students make up about 22%. MSU designed the 31-credit MS in supply chain management for supply chain managers and mid- to top-level executives ready to advance their careers. The program helps students develop broad knowledge regarding supply chain management and integrated analysis of solving supply chain challenges. Learners focus on the practices of distribution, operations, and procurement. Through this blended master's degree in logistics and supply chain management online, students learn to drive innovation and vision, develop and implement integrated strategies, and use analytical methods and technology to efficiently manage the flow of information, materials and services. They also explore the role of supply chains in enterprise strategy, and how to improve operating practices. MSU's blended format includes three weekend sessions, in which students participate in interactive case studies, breakout sessions, and simulation assignments at the university's East Lansing campus. MSU delivers all other course content in the logistics management master's degree online through a web-based platform. The degree comprises 13 courses in total, covering topics such as applied data analysis, distribution fulfillment, and lean enterprise. Applicants must hold an undergraduate degree with a minimum 3.0 GPA, plus two years of work experience. Those with three or more years of experience and who meet the GPA requirement do not need to submit GRE or GMAT scores. Founded in 1855 as the nation's first land-grant college, MSU holds accreditation from the Higher Learning Commission. Founded in 1870, Syracuse University operates as a private research university centrally located in Syracuse, New York. Regionally accredited by the Middle States Commission on Higher Education, Syracuse offers more than 200 majors, 100 minors, and 200 advanced degree programs. Enrollment tops 22,475, with approximately 29.5% of students pursuing graduate degrees. The Whitman School of Management offered the first supply chain management program in 1919, and since then has transitioned their program to a distance option. With the online MBA specializing in supply chain management, Syracuse presents a 54-credit program which students can complete in as little as 24 months. The curriculum divides into 12 core courses and five electives, and requires 3-6 three-day residencies. Residencies take place on-campus or in a designated city, like New York, Denver, or Munich. The master's degree in logistics online program teaches professionals to mitigate risk in global supply chains and integrate operational strategies using information technology, optimization, and the case method. In addition to the core MBA's 36 credits, students in the supply chain management track complete courses in operations, the principles of management science, and supply chain and logistics management. To round out the specialization, students choose between three topics: business analytics, project management, or Lean Six Sigma. Each semester lasts 12 weeks. Candidates with at least five years of work experience may qualify for a GMAT waiver. Syracuse expects MBA applicants to demonstrate at least one year of work experience. Applications should include official transcripts verifying the candidate holds a bachelor's degree from an accredited college or university, two letters of recommendation, and two personal essays. Georgia College & State University, a public liberal arts college in Milledgeville, Georgia, educates nearly 7,000 students each year. Founded in 1889, Georgia College now features four colleges dedicated to the arts and sciences, health sciences, education, and business. Georgia College also continues to expand the school's offerings with online components, including the ranked master of nursing and WebMBA programs. Georgia College's master of logistics and supply chain management (MLSCM) offers a cohort-based, fully online program, with roots dating back more than 40 years. Enrolled MLSCM students follow the program's 30-hour curriculum in lock step, taking two courses per semester. These asynchronous classes allow students to log in at their convenience, and Georgia College admits a new cohort every fall. Before beginning the program, which holds accreditation from the Association to Advance Collegiate Schools of Business, students must complete a college-level statistics course. The curriculum splits between 21 credit hours of core classes and nine in electives. Core topics include supply chain management strategy, logistics processes, logistics quantitative methods, and inventory control. In supply chain and logistics leadership course, students learn to work across functions and with different business units throughout a company, and with supply chain partners. Admission to the online master's in supply chain management and logistics program at Georgia College depends on the strength of each applicant's undergraduate academic record and GMAT or GRE score. Prospective students can apply for a GMAT/GRE waiver if they meet one of three criteria, including significant full-time work experience. Georgia College holds regional accreditation from the Southern Association of Colleges and Schools Commission on Colleges. UNL has prioritized educational accessibility for more than a century. Over the years, the university’s distance education system changed from offering only postal correspondence courses to a variety of online degree offerings. UNL’s flexible MBA with a specialization in supply chain management features five specialization options that allow students to carve out an individual educational and career path. The 48-credit program includes 30 credit hours of core courses in marketing, finance, analytics, policy, and management. Students also complete 18 elective credits, with nine supply chain management courses to choose from. While most of UNL’s online classes use a synchronous format, many offer asynchronous elements. Learners complete two eight-week class terms each semester and may begin taking classes during any session. Some students may finish their online MBA in 18 months, although most take three years to complete the program. Candidates may also earn a graduate certificate in business analytics or supply chain management. Applicants to the master's degree in logistics and supply chain management online program must possess a bachelor's degree. UNL also recommends that prospective students hold a 3.0 GPA, two years of professional leadership experience, and a 600 GMAT score or higher. Candidates must also complete prerequisite statistics and calculus courses before enrolling in certain core courses. Students may transfer up to 12 graduate-level credits from programs accredited by the Association to Advance Collegiate Schools of Business. One of two core campuses in the Indiana University system, IU Bloomington offers more than 125 web-based degrees, including an online MBA. Presented through the university’s renowned Kelley School of Business, the MBA with a specialization in supply chain and operations blends logistics with advanced business training. The 51- to 54-credit program consists of 12 elective and 39 core credits, including six credits in business fundamentals, 18 integrated core course credits, and 12 credits of supply chain and operations coursework. Students also complete two week-long immersion sessions on campus. Most online MBA courses are delivered in a synchronous format, with live meetings and sessions scheduled outside of traditional business hours to accommodate working professionals. Some classes, particularly the electives, may offer asynchronous scheduling. Most full-time students can complete the degree in less than two years. 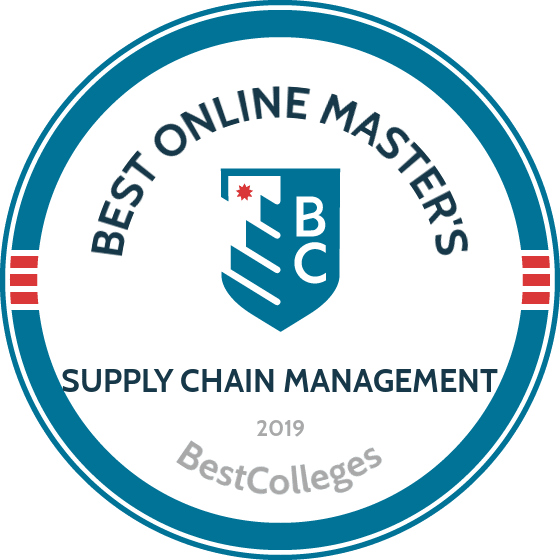 Candidates earning a master's in supply chain management online may also pursue a dual degree, completing the 30-credit MS in global supply chain management with as few as 12 additional credits. Covering topics in distribution, logistics, and operations, this MS degree requires between 15 months and three years of study. Most learners complete the 63-credit dual degree in less than three years. While IU Bloomington features flexible admission requirements, the university recommends that applicants hold a 3.3 GPA, 636 GMAT score, and two years of professional work experience. Online students enjoy access to career services assistance and virtual academic support. IU Bloomington holds accreditation from the Higher Learning Commission, and the Kelley School of Business holds accreditation from the Association to Advance Collegiate Schools of Business. With more than 135 study locations worldwide and a 25-year history in online education, ERAU brings high-quality educational programs to students all over the world. The institution offers 20 master's degrees, including an online MS in logistics and supply chain management. This 30-credit program teaches candidates to manage the policies, regulations, and risks associated with global logistics. The curriculum’s 24-credit core includes courses in management science, procurement in the aviation industry, integrated logistics, and a capstone course. Students also complete six elective credits. The program culminates in a capstone course and comprehensive final exam. Graduates can sit for three different industry certification exams. Most of ERAU’s online graduate courses last 12 weeks and typically use an asynchronous format. Students may begin classes on any of 10 annual start dates. Learners who wish to take on a heavier course load can pursue an accelerated master's degree in logistics and supply chain management online, completing the entire degree in one year. Qualified applicants must possess a bachelor's degree with a 2.5 undergraduate GPA. Students with previous graduate-level education and a 3.0 GPA may transfer up to 12 credits toward their degree at ERAU. Applicants need to complete prerequisite business coursework in accounting, economics, finance, marketing, management, and quantitative methods. ERAU holds accreditation from the Southern Association of Colleges and Schools, and the program holds accreditation from the Accreditation Council for Business Schools & Programs. UWF rolled out its first online program in 1998 -- more than 30 years after the university began offering classes. Today, UWF students can choose from more than 600 online course options and 50 online degrees, including 19 graduate programs that feature over 30 specializations. The MBA program offers four emphases, including a supply chain logistics management concentration. Exploring business fundamentals, logistics policies, and global distribution, the university’s online MBA with an emphasis on supply chain logistics management trains students to apply logistics expertise to business challenges. The 36-credit online supply chain management master's degree includes courses in business foundations, analytics, management, and policy formulation. Online students benefit from five start dates and typically complete the program in less than 16 months. While most online MBA courses are asynchronous, some may require scheduled meetings or class times. Successful applicants possess a bachelor's degree with a 3.0 GPA demonstrating that they have completed a business fundamentals course. UWF may accept applicants with a 2.75 undergraduate GPA if they possess eight years of professionals experience. Prospective students should also submit GRE or GMAT scores, although applicants with a 3.25 GPA or higher may see the GRE or GMAT requirements waived. Applicants must also provide a resume, personal essay, and two letters of recommendation. While out-of-state students pay a higher tuition rate than Florida residents, qualifying applicants may apply for a tuition waiver that reduces costs up to 90%. UWF holds accreditation from the Southern Association of Colleges and Schools. With regional campuses located throughout Florida and a comprehensive online learning division, NSU strives to promote accessible higher education. The university’s web-based MBA programs feature 12 concentration options, including an online MBA in supply chain management and operational systems. Consisting of 40-49 credit hours, the program presents strategies for improving organizational logistics and supply chain management through information systems and advanced technologies. Students can begin their degree on one of five annual start dates and complete the program in 21 months. Candidates who have not completed mandatory prerequisite courses in business finance, introductory accounting, and business statistics must do so prior to graduation. The curriculum includes 22-31 core credits that provide advanced training in fundamental business competencies and methods. Learners also complete 15 credits in the supply chain management concentration. These courses address advanced management strategies, customer relationship development, and leadership methods. Learners may earn their final three credits by enrolling in another elective course or completing an internship. Candidates who wish to earn a master's degree in logistics and supply chain management online must hold a bachelor's degree and a 2.5 undergraduate GPA. Individuals who do not meet the GPA requirement may qualify for admission by demonstrating satisfactory GMAT or GRE scores. Students with prior graduate education from an accredited institution and a 3.0 GPA may transfer up to six credits toward their degree at NSU. Graduates can sit for three international industry certifications. NSU holds accreditation from the Southern Association of Colleges and Schools. Founded in Chicago in 1969, GSU prioritizes innovation and flexibility. In addition to more than 200 web-based courses, GSU’s distance learning program offers over seven degrees, including an online MBA in supply chain management. One of four available MBA specializations, the supply chain management degree is the only option presented entirely online. The unique program instills competencies needed to manage production, procurement, and delivery in a tech-focused and globalized world. The online supply chain master's consists of 36 credit hours and requires 18 months of asynchronous study. Learners spend most of their time completing the 24-credit curriculum core. These advanced business courses cover management, forecasting, and global organization behaviors. In an additional nine credit hours, candidates take specialized classes in procurement, supply chain management, and logistics. The program culminates in a three-credit capstone project consisting of an in-depth case study. Eligible students may opt to compose a thesis in place of the capstone. All learners participate in a professional development seminar. Applicants must possess a bachelor's degree and a 3.0 GPA. Those with a GPA lower than 3.5 must submit GRE or GMAT scores. While prospective students may hold a degree in any field, candidates without a business degree may need to complete prerequisite courses in calculus, written communications, and business foundations. The GSU Foundation sponsors more than 40 scholarships, and students interested in pursuing a dual degree may qualify for special funding opportunities. GSU holds accreditation from the Higher Learning Commission, and the business college is accredited by the Association to Advance Collegiate Schools of Business. The state’s first public university, U of A opened its doors in 1871 and continues to offer cutting-edge academic programs. Distance learners can choose from 20 online and hybrid master's degrees. The university’s MBA program features five concentration options, including an executive MBA with a focus in supply chain management. In addition to foundational MBA coursework, this track explores advanced concepts in supply chain management and analytics. Distance learners pursuing a master's degree in logistics and supply chain management online complete 38 credits and graduate in two years. All students complete a statistics boot camp and a strategy course in the summer session preceding the first fall semester. First year coursework examines topics in marketing, finance, and leadership. Second-year students study global business and analytics, in addition to six credit hours in their focus area. Learners must participate in one on-campus Saturday session every month. While U of A maintains flexible admission requirements, the university recommends that prospective students demonstrate a 3.0 undergraduate GPA and a GMAT score of 600 or higher. Applicants with five years of relevant work experience do not need to provide GMAT scores. In- and out-of-state students pay identical tuition rates. U of A holds accreditation from the Higher Learning Commission, and the business school holds accreditation from the Association to Advance Collegiate Schools of Business. Based in St. Charles, Missouri, Lindenwood has remained at the forefront of educational innovation for nearly 200 years. Combining tradition and emerging technologies, the university continues to introduce new programs and new delivery methods, offering 31 online degrees and more than 100 web-based courses each semester. Candidates enrolled in Lindenwood’s business program can select from 10 emphases, including an MBA with a emphasis in supply chain management. While students can access all the business programs online, some emphasis options may require on-campus visits. Requiring 39-54 total credit hours, the logistics management master's degree online includes 27 core business credits and a final capstone course. Learners may fill the remaining 12 credit hours with elective coursework. The 12-credit supply chain emphasis explores topics in logistics, procurement, operations, and supply chain management. Students may also choose to take a three-credit internship elective. Prospective distance students should hold a bachelor's degree with a 3.0 GPA. Candidates with a lower GPA typically need to submit GRE or GMAT test scores. While the program accepts students with bachelor’s degrees in any field, applicants without a business background may need to complete up to 15 business foundation credits. Students with previous graduate-level training and a 3.0 GPA may transfer up to nine credits toward their MBA at Lindenwood. Tuition rates vary according to program, state of residence, and student enrollment status. The university sponsors academic and endowed scholarships and a need-based grant program. Lindenwood holds accreditation from the Higher Learning Commission, and its business school holds accreditation from Accreditation Council for Business Schools and Programs. Long-distance Loyola students have benefited from the university's online degree offerings since 1998. More than 20 years later, Loyola’s distance learning division has expanded to provide over 45 online programs, including 21 graduate options. Loyola’s 36-credit MS in supply chain management explores logistics, purchasing, distribution, and warehousing. Emphasizing applied technological and quantitative training, the program holds a STEM designation from the Department of Homeland Security. Along with seven core business courses, candidates receive training in logistics, database systems, and forecasting. Students also complete a required ethics course and a final capstone project. Learners spend the remaining nine credit hours in the master's degree in logistics and supply chain management online exploring specialized topics and advanced concepts in the field. While most required courses are available online, some classes are held at the Water Tower Campus in Chicago. Both on-campus and online courses are scheduled after traditional business hours or on the weekends to support working professionals as they study. Courses run throughout 10-week quarter terms. Students can complete three or four courses each term and complete the entire master's degree in one year. Prospective students should hold a bachelor's degree with a 3.0 undergraduate GPA and provide GRE or GMAT scores. Applicants without prior business education may need to complete prerequisite courses in statistics and operations management. Loyola holds accreditation from the Higher Learning Commission, and the business school holds accreditation from the Association to Advance Collegiate Schools of Business. A pioneer in distance education, Liberty began offering correspondence courses in 1985 and now offers 400 online programs. Today’s Liberty students interested in supply chain management benefit from two program options. Those who wish to enter the business world can pursue the online MBA in supply chain management and logistics, which provides leadership training and the expertise to manage an organization's resources through distribution and logistics. The MS in healthcare administration in supply chain management, meanwhile, trains candidates to manage supply chains within healthcare settings. The online MBA requires 45 total credits, including 33 core business credits. The 12-credit supply chain management specialization introduces topics in supply chain management, logistics, and quality management, along with an elective course. Students typically graduate within two years, although Liberty allows learners to spend up to five years completing the program. The online healthcare MS features 48 credits in total, including 39 core healthcare administration credits. Students take the same supply chain management courses as MBA candidates, minus the elective. While the MS includes more credit hours, most students complete the degree faster than the MBA, finishing in around 18 months. Both programs feature eight-week terms. Candidates interested in either of the master's degrees in logistics online must hold a bachelor's degree and a 3.0 GPA. Students with previous graduate-level education may transfer up to 50% of their required credits to their degree at Liberty. Liberty holds accreditation from the Southern Association of Colleges and Schools. Its business school holds accreditation from the Accreditation Council for Business Schools and Programs. TAMIU’s online programs bring rigorous academics and flexible schedules to students all over the world. Most of the university’s 11 online degrees are graduate-level programs developed to help working professionals achieve success without sacrificing their careers. TAMIU’s online MBA in international trade and logistics prepares students to manage and operate international imports and exports. The 30-credit program includes 21 credit hours of core business courses like research methods, finance, and management. Nine additional credits explore specialized topics such as import operations, export operations, and international logistics. Distance learners can begin their studies on any of six annual start dates. Courses are asynchronous and run for seven weeks, allowing students to build a schedule that best suits their schedule. Most learners complete the entire master's degree in logistics and supply chain management online in less than 15 months. Along with a bachelor's degree, prospective students must hold a 3.0 undergraduate GPA or higher. Candidates who do not meet the minimum GPA requirement may need to submit GRE or GMAT scores. While students from non-business academic backgrounds may apply to the program, they need to complete prerequisite business classes before enrolling in major coursework. Students with a 3.0 GPA and previous graduate-level education may transfer up 12 credits toward their MBA. TAMIU is accredited by the Southern Association of Colleges and Schools, and its business school holds accreditation from the Association to Advance Collegiate Schools of Business. LSU’s distance education program offers eight master's degrees, including a flexible online MBA program with concentration options. The MBA with a concentration in supply chain management combines traditional business fundamentals with up-to-date, logistics-based leadership and analysis strategies. Thirty-three of the program’s 42 credit hours cover advanced concepts in economics, marketing, management, and organizational behavior. Students also complete nine elective credits in the supply chain management concentration. Most learners complete the degree in 18-27 months. All of LSU’s online courses are asynchronous and last for seven weeks. Flexible schedules and six year-round start dates allow students to take one or multiple classes per session and customize their educational path -- accelerating the degree or pacing it to accommodate a working schedule. LSU’s alumni network provides students and graduates alike with networking opportunities and career advice. Prospective online master's in logistics and supply chain management candidates must possess a bachelor's degree and demonstrate a 3.0 undergraduate GPA and three years of professional experience. Applicants with GMAT scores of 600 and GRE scores of 315 receive preference. Individuals who meet the defined GPA and work experience standards may waive the GRE requirement. LSU holds accreditation from the Southern Association of Colleges and Schools, and the business college holds accreditation from the Association to Advance Collegiate Schools of Business. Students pursuing a master's in supply chain management online should know that the program will vary slightly between schools. The cost, number of credits required, time of completion, courses offered, capstone projects, and extracurricular requirements are different for every program. Individual courses vary among online master's in supply chain management programs. Some schools take a more business-heavy approach in their curriculum while others focus on the science of supply chain management. Below is a list of courses you may encounter. Supply Chain Management: With introductory and advanced classes, most schools feature several core requirements in supply chain management. Classes focus on how to combine supply and demand management for optimal business results. Case studies are often used to teach the framework of supply chain management. Operations Planning: Part of supply chain management is to keep all of the operations running smoothly. Often paired with organizational theory courses, students learn various strategies for managing logistics operations. Business Law: Particularly important in international industries, business law is critical to any supply chain management. Students will learn the legal and ethical requirements necessary for importing, exporting, and more. Logistics/Transportation Analysis: Trains, trucks, and ships are the critical links in the supply chain. Master's in supply chain management online students must learn how to analyze current transportation and logistical systems and optimize them for better efficiency. HOW LONG DOES IT TAKE TO GET AN ONLINE MASTER'S IN SUPPLY CHAIN MANAGEMENT? One factor for the completion time of a supply chain management degree online is whether it is taught completely online or with hybrid components. Some of the best online programs require some campus component, which may impact student's schedules. Other major completion time factors include credit requirements, whether the program is taught with a cohort or allows personal pacing, and the type of degree. Some supply chain management degrees are part of an MBA while others are professional graduate degrees. Most master's in supply chain management online degrees require 30 credits and are completed in about two years. A certification can open up other career pathways. Some require students to study and pass exams, while others have prerequisites requiring graduates to have worked in the industry for a certain amount of time. Certified Professional in Supply Management: Given by the Institute for Supply Management, the CPSM requires experience and exams. The CPSM rewards a specialization in "purchasing and procurement." Certified in Production and Inventory Management: Requiring five exams, The Association for Operations Management (APICS) credential is among the most important certifications. It can be used in a variety of careers and paired with other certifications. CPIM-holders are certified experts in the field of inventory management. Certified Supply Chain Professional: APICS' CSCP certificate is the most general and comprehensive, requiring experience and an exam. The CSCP represents proficiency in a wide range of areas. The best online master's in supply chain management or logistics degrees are either accredited nationally or regionally. Nationally accredited schools are recognized by the Council for Higher Education Association (CHEA). This nongovernmental industry group accredits schools based on a series of criteria proving that it's academically and operationally proficient. National accreditation is used for vocational learning, distance education, and continuing education. Traditional brick and mortar universities are typically regionally accredited. There are six regional accrediting agencies in the U.S. These agencies are run by leaders in peer institutions and approved by the CHEA and the Department of Education (DOE). Regional accreditation is typically more valuable and sought after by employers. Some programs are individually accredited by industry groups. The DOE does not accredit schools. The department acts as an oversight body, recognizing legitimate actors and ensuring proper accreditation practices. You can find a list of accredited schools and programs on the DOE's website or on CHEA's.